In these days of economic gloom, cruise fares may soon be coming down to attract more cruisers in a recession. But there is another silver lining to be found in the world of sea travel. In the realm of freighter travel, fares have not gone up for several years, the dollar now buys 15% more euros than three months ago (most freighter fares are set in euros), there is no such thing as "onboard revenue" generation, drinks are still duty free and not charged at shoreside hotel prices and there are no fuel surcharges. And there are no casinos and no cruise directors, with their organised entertainment. So let's have a look at this rather unusual method of having a holiday at sea. Unlike the cruise lines, that constantly change fares using a system of yield management that depends on supply and demand, cargo ship owners charge a simple rate per day, which has not varied tremendously for several years now. Typically, German operators charge between €85 and €105 per person per day plus dues and taxes of about €200 for each voyage and French and Italian owners charge all-inclusive fares of between €100 and €120 per person per day. Although a ticket must be issued in advance, you can get on almost where you want and disembark the same way, or you may break your trip along the way, as fares are all charged per day for the actual time spent on board. Now let's look at the three types of freighter travel experience. There are two surviving passenger-cargo ships today, the 180-passenger Aranui 3 and the 124-passenger St Helena. These were built to supply islands, in the case of the Aranui 3 the Pacific islands of the Marquesas and the Tuamotus, from Tahiti, and in the case of the St Helena, the Atlantic islands of St Helena and Ascension, from Cape Town, plus a couple of trips a year from the UK. These purpose-built ships offer a very sociable experience, a voyage of plus or minus three weeks in the company of about 100 other people as they carry supplies to the islands they serve. In both cases, rather than travel by sea, most intending passengers fly to the ship to join in on this experience. 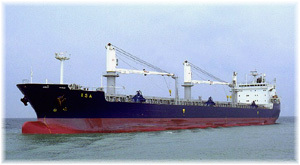 The second type of ship is a bulk carrier, general cargo or multi-purpose type ship carrying six to twelve passengers. Four routes offer this opportunity. Two are the Bank Line and Rickmers Pearl String Round-the-World services, each taking about 124 days. The third is a round trip from Amsterdam to the Great Lakes by Polish Steamship Company bulk carrier, which takes about half as long. And the third is a trip in a Horn Line banana boat between Europe and the Caribbean, which takes about 35 days. The Round-the-World ships carry general and project cargo as well as containers, the Great Lakes ships carry steel to the lakes and grain or other cargoes back to Europe, and the banana boats carry some general cargo in addition to their backhauls of bananas. All of these ships tend to spend more time in port but the Bank Line is now booked well into 2010. The third type of cargo-passenger experience is taking a fast container ship along with five to ten passengers on one of the major world trade routes. These ships spend less time in port and run to tighter schedules, which as they do also means that they can be used for port-to-port travel by those who do not like to fly. Routes that they operate include Australasia, the Far East, South America (both coasts), South Africa and the Indian Ocean to name just a few, not to mention the usual Trans-Atlantic and Trans-Pacific runs. These ships are fast and can travel at speeds up to 24 knots and, carrying so as many thousand containers as they do, are large, often over 100,000 tons. It is the owners' suites on these ships that offer a very high standard of accommodation for very little extra premium. The typical suite includes a living room, often with bar set-up, bedroom and en suite facilities on a higher deck somewhere near the captain and the bridge. A forward view cannot always be guaranteed, however, depending on the container load. In all cases, passengers dine with the officers and are usually allowed on the bridge as long as they do not create a nuisance of themselves. If there is not a separate passenger lounge they will share one with the officers, there are swimming pools, saunas and exercise rooms and all cabins are en suite. They are all-outside, and often suites of separate dayroom and bedroom except on Grimaldi, the only line to include inside staterooms in their larger vehicle carriers. French and Italian ships also serve complimentary table wine with lunch and dinner but on German ships wine can still be obtained at very low shipboard prices. Two or three years ago there really was no slow boat to China any more. As container ships got faster, round trips were cut from 63 days (9 weeks) to 56 days (8 weeks) between UK and Continental ports and China and the Far East as these new ships were delivered. The routes of the old Blue Funnel Line were now operated by fast container ships working for the likes of CMA CGM, Evergreen Line, Hanjin Shipping and Senator Lines. But this month, the "slow boat to China" has returned. With the higher cost of fuel, some of the Far East lines have now extended their round voyage duration to 70 days (10 weeks), so travellers can now take a more leisurely pace if they want to. Since the Chinese boom, there have been plenty of ships operating in this trade and the fact that, unlike in Australia, there is no visiting friends and relatives market means it is nearly always possible to get space. Many of these services now run weekly, from both Europe and North America. On the other hand, if you think you can ring up and book yourself off an a trip to the South Seas at a moment's notice, you'll have to think again as this is where many are disappointed. This is the most popular route by far, the one connecting the Northern and Southern Hemispheres between Europe and North America and Australia and New Zealand. 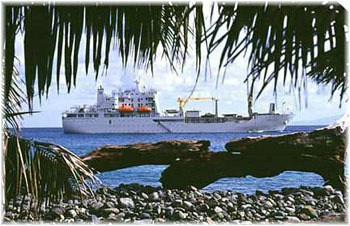 While ten passenger-carrying cargo ships operate between Europe, the United States and Australasia through Panama (fourteen if we include the Bank Line service to New Zealand), only three run between Europe and Australasia via the Suez Canal, so if you want to go through Suez plan early, and that means a year or more in advance. Non-American travellers on the Panama route must also remember that they will need a full US visa for US port calls, as the US Visa Waiver Program does not include cargo ships. The most shocking news in this trade is that since 2007 there has been no direct service between the US East Coast and the UK and North Continental ports. Except in times of was, this is the first time in more than a century that it has not been possible to catch a freighter between the US East Coast and say Liverpool or Antwerp. Indeed, the last time this was not possible was more than sixty years ago, during World War II. This came about when the ships on the last Philadelphia-Antwerp service stopped carrying passengers a few months ago, and is thought partly to have been brought about by new US security requirements, which made it more difficult to carry passengers. Passengers for the UK and Continent can still travel by way of Montreal or the Great Lakes however. A weekly service is offered between Montreal, Liverpool and Antwerp but passengers are not always carried in the winter. 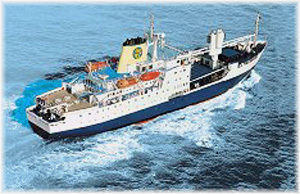 There is still year-round service however between New York, Norfolk, Savannah and Miami and ports in the Mediterranean. The big Trans-Pacific routes are between the US West Coast and Japan, China and the Far East and weekly service is now available to and from both Long Beach and Seattle. To and from Australia and New Zealand, however, it is almost impossible to get space as there are only two ships on this route and one of them is coming off the route in June. Again, non-North Americans need US visas to travel this way, unless they embark at the last US port of call. Just who travels this way? These days, it is mainly retired and early retired people who can afford the time. It takes about a day to travel by sea as far as you can in an hour by air. But there are age limits, usually 75 or 79, although Grimaldi allows up to age 85, as there is no doctor on board. Many travellers are returning students, people looking for adventure, relocating executives and their families, even airline pilots who have only seen the world from 37,000 feet, and these days, people who are simply tiring of air travel. In order just to get away from it all and allow markets to recover what better way than disappearing away to sea? There are several ways to book these voyages. Most normal travel agents don't know much about it but if you look for them there are several specialist agents who will book these trips - in the United States they are in New York, Pasadena and Westport, in Canada in Toronto, in the UK in London and Southampton, in France in Paris and Marseilles, in the Netherlands in Ijmuiden, in Germany in Bremen, Hamburg, Maasholm and in other cities. Other freighter travel specialists can be found in Denmark, Switzerland, Italy and Australia and New Zealand. A good source for detailed information is Richard Ahern's "Internet Guide to Freighter Travel," probably the most complete single-stop source, but you can also check with "The Man in Seat 61 in the UK" who specialises in rail travel.